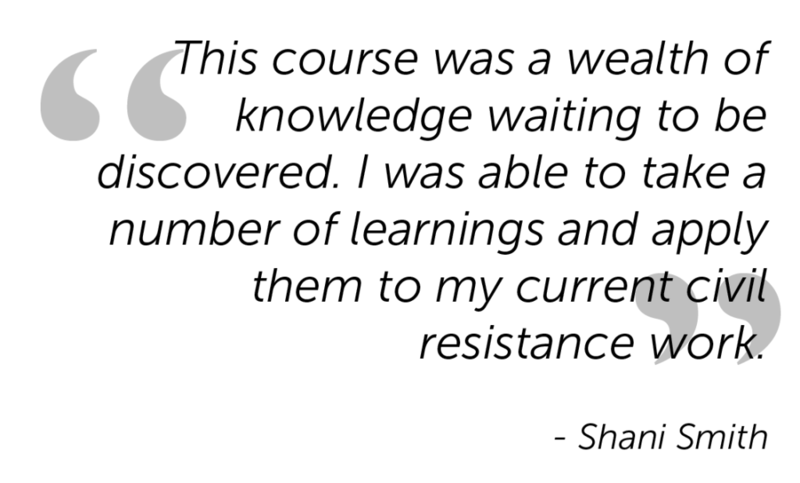 This new, participant-driven course is being offered in response to increasing demand for knowledge on civil resistance. For this particular learning experience, preference will be given to US-based applicants, but candidates from other countries with prior civil resistance knowledge and/or experience are encouraged to apply as well. CC By 2.0. Flickr user Francisco Osorio. This course will provide an advanced, in‐depth and multi‐disciplinary perspective on civilian‐based movements and campaigns that can win and defend fundamental rights and justice with the use of nonviolent tactics and strategies. The course will take place on ICNC’s online learning platform (civilresistancestudies.org) for admitted participants starting on December 6. An orientation webinar, offered on December 7, will guide participants through signing up, logging in, interacting in the online space, and getting the most out of the online learning experience. All course materials – primarily readings and videos – will be provided free-of-charge to admitted participants. The application deadline is Sunday, December 4, 2016 at 11:59pm ET. Why is ICNC offering this online course? ICNC has received rapidly increasing demand for knowledge and greater understanding of the dynamics and power of civil resistance around the world in last several years. Various individuals, groups and organizations in the US and abroad are reaching out to us in record numbers to inquire about civil resistance learning opportunities. However, we do not have the staff capacity to respond to all these requests, and online courses provide a way for us to achieve greater scale and reach more people in our efforts. Building on a recent ICNC online course offered in partnership with Rutgers University, the “Civil Resistance Unpacked: Strategic Practice and Analysis” online course offers modules on civil resistance with a variety of readings and videos that guide participants in their learning, online discussions, and interactions. 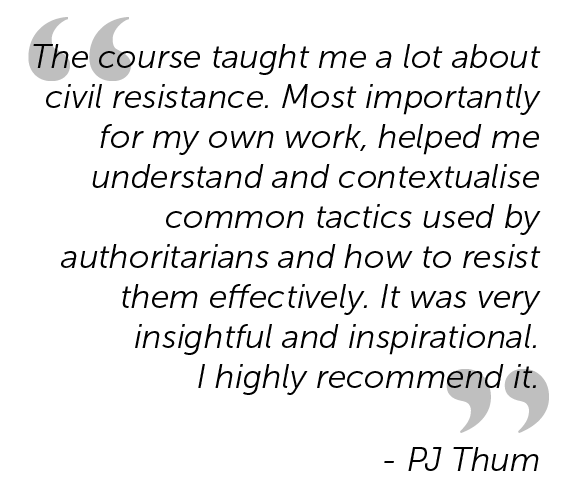 Activists, organizers, scholars, students, members of the policy community and NGOs, journalists, and others with some previous experience with and knowledge about civil resistance are all sure to find great theoretical and practical value in taking this course. As ICNC is offering this course on short notice, we have drawn content from the recent ICNC-Rutgers online course and turned it into a self-standing, participant-driven course. What is meant by “participant-driven” course? The main difference between this course and our previous online seminars is in the way that online interactions are envisaged to take place. Civil Resistance Unpacked will be an entirely participant-driven course whereby, after reviewing relevant modules, participants will interact with one another on various forums without additional ICNC moderation or substantive input. In that sense, participants will be part of a learning community that is built around participants’ motivation, open attitude to learning, desire to share and interact with others, and relevant knowledge and experience. ICNC plans to admit up to 50 highly motivated participants who commit to reviewing course content, contributing in writing to discussion forums, and engaging with other participants in insightful exchanges around ideas presented in course materials. We are looking for people who have strong motivation and who are willing to engage with other participants and share their knowledge and experience with nonviolent movements and campaigns. 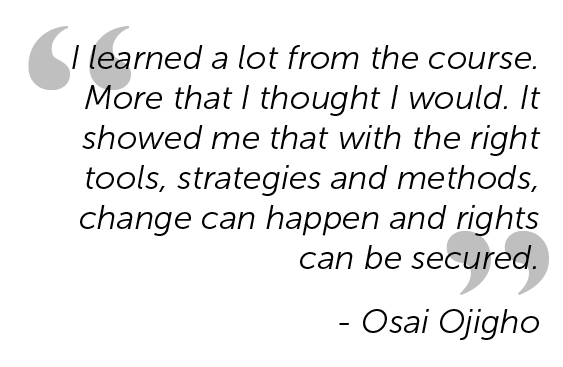 We encourage US- and non-US based scholars, educators, field practitioners (i.e. activists and organizers), members of civil society, policy professionals, and journalists to apply to take this course. For this particular course, preference will be given for US-based applicants. Anyone who applies must be willing to commit to the time and activity requirements and code of conduct for the course, both outlined below. Once admitted to the online course participants will form a learning community, whose intellectual strength and vibrancy will depend solely upon its members and their active and insightful written contributions (posts) in various forums. No outside moderators will join this class and no moderation will be offered. A specific set of questions set up in advance by course administrators in the discussion forums will guide participants’ exchanges. In these forums, participants are expected to monitor and read other learners’ posts, share innovative ideas and thoughts within the learning community, ask follow-up questions to other participants, suggest answers and plausible solutions as well as, in rare cases, flag any inappropriate behavior on the forums. Because no outside moderation of online discussions is envisaged for this course, a specific code of conduct has been developed to ensure that participant interactions and knowledge sharing are as meaningful, substantive, and respectful as possible. Participants will be responsible for following and enforcing the code of conduct of their learning community throughout the duration of the course. Review assigned material (readings/videos) included in the course chapters, before responding to questions raised in the forums. Keep an open mind and a desire to learn from others. People in the community may have strong perspectives, but do not dismiss others simply because they have a different perspective. Focus on the phenomenon of civil resistance. If you find your conversations with other posters going onto other topics that you are interested in that are not directly related to the course, then you should feel free to take those conversations outside of the course (i.e. over email, Facebook, phone, etc.). Focus on debating ideas, and separate people from ideas in the process. If you disagree with an idea, don’t attack the person who posted the idea personally, or make assumptions about their motives. Back up your ideas, criticism and arguments with references to authoritative and verified sources or personal experience. In addition to the readings in the online course, refer to other source materials to support your statements or as a background information to the point you are making. Read carefully and in their entirety posts made by other people before replying to them. If something is not clear in someone’s else comment, do not hesitate to ask for clarifications and further explanations while you offer your own points of view on the discussed matter. Present various possible arguments that might be made around the discussed issue. Write concisely more than expansively. Post regularly to the required forums and catch up as soon as possible with your comments on the scheduled forums that you have not yet posted. Formulate your thoughts and ideas in clear language. Assume that other participants will not have any knowledge about the case that you are elaborating on. Other learners are people too, although you will not necessarily see them (however, participants will be asked to upload their headshots to their individual online profiles). In your replies to other people’s comments do not use ideological or a divisive language and instead apply objective reasoning that is backed up by evidence and arguments from authoritative sources. Share first-hand accounts and stories from your personal and professional work, study, or activity that pertain to the discussed subject matter. Humor, encouragement, praise, constructive criticism, and putting yourself in someone else’s shoes are the most effective way to engage with others and facilitate informed discussions that do not exclude anyone. No profanity or personal insults. Do not hesitate to report any inappropriate, offensive or vulgar posts to the course administrators. Unless there is a personal or family emergency, you should not abandon your learning community of fellow participants and go silent for the whole week (an average duration of the module). Do not be tardy with posting during the week as this affects negatively your and other participants’ learning progress. Do not copy and paste from outside sources when you write in forums. Use your own wording and vocabulary, though feel free to cite (and use quotation marks when you do) authoritative and verifiable sources. Do not use ad-hominem attacks or any racist, gender, religion, national origin, age, disability, sexual orientation based attacks. Do not use threats or incite any kind of violence. As part of the online course, participants engage with the assigned material and collaborate through online discussions. All admitted participants are expected to spend between 7 and 10 hours per week in the online classroom, or a minimum of 1 hour per day (7 days) for the full duration of the course on reviewing materials, posting comments about the readings and assigned videos, and interacting with/responding to other participants’ posts. Meeting these commitment requirements is essential to the learning experience, both for the participants themselves and for the group experience as a whole. Course content released each week builds on past content; therefore learning is interrupted and ineffective when participation is irregular. In addition, we believe that all of our participants have important contributions to make to the learning experience. Lack of participation and irregular or no posting are therefore also a disservice to other participants. Participation in the e-class is not restricted by time zone. Course content, forums and posts are all accessible to participants at any time of day. Civil resistance is a social and political phenomenon that defies a long-held belief in the power of arms to challenge brutal, violent adversary. Contrary to the violence-centered narrative that dominates mass media, nonviolent resistance campaigns against repressive states have been on the rise in the last few decades, surpassing violent insurgencies by almost 5 to 1 in the last 15 years. For the past several years, ICNC has supported work to develop unique datasets of nonviolent campaigns (NAVCO). In 2011, this work led to a ground-breaking quantitative study that showed that civil resistance movements often emerge and succeed in challenging environments. It also established that civil resistance struggles are more than twice as effective against violent states as armed resistance groups. 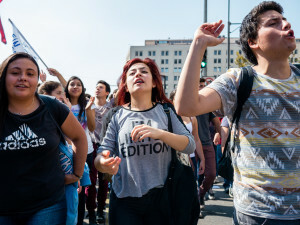 Informed by these important developments in research and the practice of civil resistance, this free, online course provides an interactive, in-depth and multidisciplinary perspective on civilian-based movements and campaigns that defend and obtain fundamental rights and justice around the world. 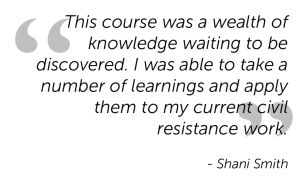 The course explains the nature of civil resistance and its force, underlying dynamics and effectiveness. During the course participants will be able to reflect on the skills and agency of ordinary people, their strategies and tactics, how movements can confront repression, the backfire effect, and how movements have caused defections among their adversaries’ supporters. We will look at how entrenched political and social structures and practices shift under the pressure of organized nonviolent movements, and the long-term impacts on societies, nations and institutions. We will also look at the role of gender and women in civil resistance. 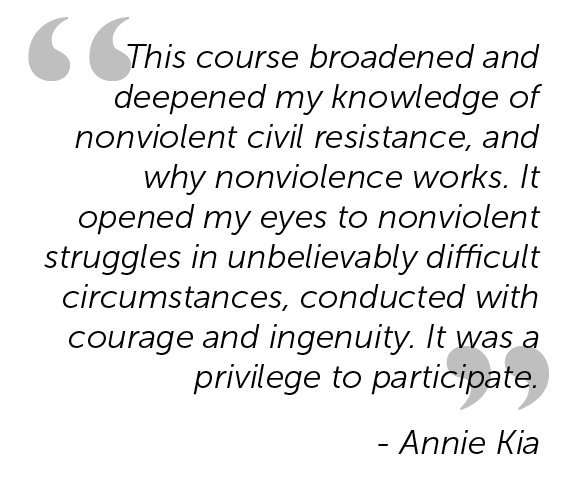 Finally, the course will also examine a variety of case studies of civil resistance struggles, including movements for democracy and human rights, as well as movements challenging corruption, corporations, and abusive and violent non-state actors. The online course will involve a number of activities to be completed within specified time frames, including forum posts and online discussions, readings, and viewing videos. To introduce cutting edge thinking and research findings on various topics in civil resistance, as outlined in the Course Content below. To discuss a variety of case studies of nonviolent campaigns and movements. To reflect on the effectiveness of civil resistance and its power to overcome challenging conditions. To provide a platform for participant exchanging and peer-to-peer learning. To offer an interactive and structured learning environment for participants to become a more informed observer of nonviolent conflicts and effective conveyor of civil resistance knowledge. Each new Module will be opened for participants on Tuesdays. What Is Civil Resistance? • The Effectiveness of Civil Resistance. If requested by a participant and awarded by ICNC, a certificate of completion will be sent by email in PDF format within three weeks after the end of the course. ICNC will not mail or provide hard copy certificates.